CORPUS CHRISTI, TX – The City of Corpus Christi is urging residents to take precautions to protect life and property. Hurricane Harvey continues to be a threat with very heavy rainfall, storm surge and high winds. To protect residents, the City is strongly encouraging residents in low lying areas to evacuate. 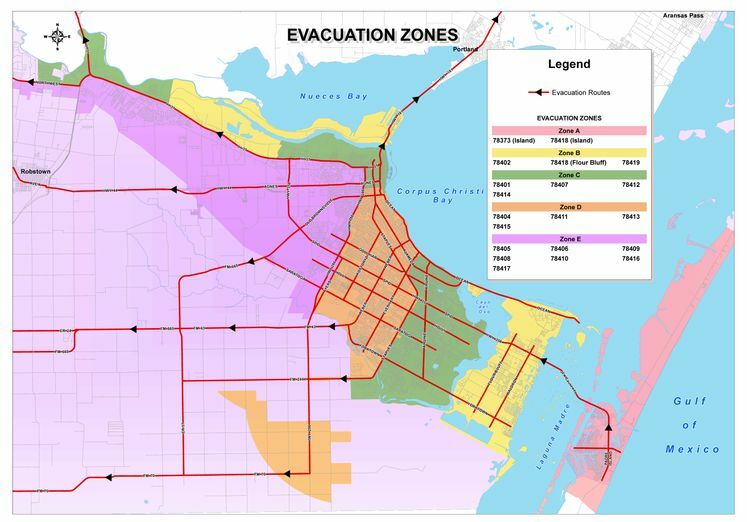 The zones involved in the recommendation include evacuation zones A & B. Anyone in these low lying areas or Zones A&B that want to evacuate and do not have the means should proceed to their nearest RTA bus stop. Residents should bring personal essentials for 3 to 4 days to be transported to the CC Gym for processing and then to San Antonio. Those with pets should bring pets on a leash or crate, medications, food and current immunization records. Self-service sandbag distribution ends at 5:00 p.m. today or when supplies are exhausted. Residents can bring their own shovels to expedite the process. All court dockets for Friday, August 25, 2017 are cancelled, including the walk-In docket. All cases will be automatically rescheduled. Defendants will be notified of their new court dates by mail. For more information, contact the Court at (361) 826-2500 or at mcmail@cctexas.com. Please stay informed and take measures to protect your family and property. If you have not signed up for ReverseAlert please do so at reversealert.org. For the latest updates on Tropical Storm Harvey, stay connected at www.cctexas.com/harvey. Details are also available at facebook.com/citygov and at twitter.com/cityofcc.